<< Strong point of the product >>. It uses a mixture of water (700cc) and air (500cc) when cleaning, making the cleaning fast and soft and helping you save up to 500cc of water per minute. Easily adjustable water temperature even when using the bidet. Comfortable use/personal cleaning with the remote control. No need to turn the bathroom lights on when selecting the Light button. The built-in UV lamp stops the growth of any germ/bacteria on the toilet and bidet. Deodorizing function included to neutralize any odor in your bathroom. You can add an air freshener in the cartridge to keep your bathroom smelling fresh. Automatic self-cleaning nozzle with the pressing of one button. Regular energy-saving or hourly energy-saving functions included. The continuous release of water in constant temperature makes it useful to sitz (hip) bath users. User-friendly functions for easy use of the bidet. Large and medium size bidets for your best option check the size of your toilet first. Removable twin nozzles for better personal cleaning. Water purifying filter included for better personal hygiene. 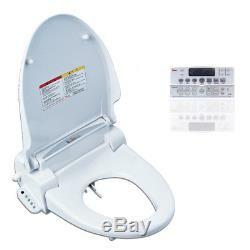 Occupied Seat Sensor for your safety: the bidet only activates once it is occupied and senses skin. No skin burns thanks to its built-in temperature detector. Bidet does not freeze even in very cold places thanks to its Freeze Protection System. Please make sure you have selected right options prior to completing the order. You can request for cancellation of the applicable product via our Q&A board. Products that are out of stock. Order number, product code of the out-of-stock product, and the reason for the request are required (out-of-stock). Order number, product codes of the out-of-stock products, and the reason for the request are required (out-of-stock). Order number, product codes of the mis-delivered or defective products, and the reason for the request are required (mis-delivered/defective). Model name : Q7700 / Q7100. India / Qatar / Saudi Arabia. Russia / Kazakhstan / Ukraine. Brazil / Argentina / Chile / South America. Depending on many factors it may take more. Exteriors and specifications of the product can be changed for an improvement without any prior notice. All image shots can be different from the real product, and there may be A differences in color RENDERING , the monitor resolution, monitor brightness, and computer specifications. Only the actual price must be declared. Please be aware of this notification. FEEDBACK CONTACT We try our best to put customers' satisfaction as first priority. Most of the time we find the resolution that satisfies customers needs. Please don't be so quick to leave negative/neutral feedbacks. We really appreciate your business with us. Note that we are out of our office on the weekends, but we will get back to you as soon as we can. The item "QUOSS Premium Smart Bidet Q7100/Q7700 Q7700" is in sale since Tuesday, October 16, 2018. This item is in the category "Home & Garden\Home Improvement\Plumbing & Fixtures\Bidets & Toilet Attachments". The seller is "dream-seller" and is located in Kyunggido. This item can be shipped worldwide.